If people could eat just one donut, perhaps they wouldn’t be the symbol of caloric overindulgence that they are today. However, that can be hard to do, and donuts are ubiquitous at meetings, socials and other gatherings. The important thing about the calories in a donut is the nutrients that they do -- or don’t -- provide. A medium donut measuring almost 4 inches across contains 255 calories. While eating one donut with coffee for breakfast won’t ruin your diet plan for the day, consuming two or three of them will. The calories in donuts are primarily empty calories, as donuts are low in nutrients. Donuts have small amounts of calcium, magnesium and potassium along with trace amounts of iron and many vitamins. They do not have significant amounts of any nutrient. Donuts are prepared by frying rounds of dough in oil. One medium donut contains over 12 g fat, some of which may be saturated. Whether a donut has saturated fat depends on the type of oil that it is fried in. 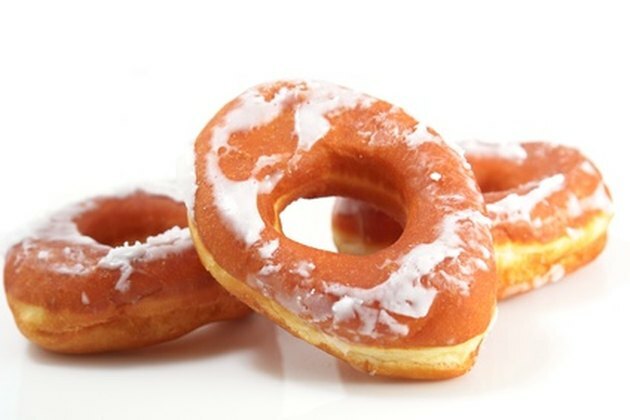 Occasionally, donuts are fried in lard, which greatly increases the amount of saturated fat they contain. Eat donuts that have been fried in polyunsaturated oil such as soybean oil. Canola oil is an even better option, and one that you can use if you prepare donuts at home. A medium donut contains approximately 4 g protein. The protein in a donut comes from the milk and wheat flour used in the recipe. Donuts have much more carbohydrate than protein, with a medium donut containing 32 g carbohydrate. Eat donuts in moderation, as the carbohydrate they contain is refined carbohydrate. Refined carbohydrates contribute to weight gain and promote diabetes and heart disease according to Harvard’s School of Public Health. Glazed donuts typically are a fairly standard size. Different versions of glazed donuts include twists and honeybuns, both of which contain approximately 350 calories as well as additional grams of fat. Donuts come in small and jumbo sizes as well as donut “holes.” Glazed donuts may be covered with frosting, nuts or sprinkles, all of which add additional calories. Some glazed donuts are filled with fruit or cream filling. If you’re accustomed to grabbing a donut or two every morning, you can save calories and fat grams by choosing a different food with which to start your day. Try making a batch of low-fat muffins or toast an English muffin and add a bit of jam. If you’re on the run, consider grabbing a breakfast taco with egg and salsa or a piece of fruit. Even eating one donut instead of two can save you over 7000 calories a month, if two donuts are your daily habit.